My Grandmother's Nephew Francis served during world war one with the Loyal North East Lancashire regiment. Tragically he committed suicide by throwing himself ou of an upper floor window at 300 Beaufort street onto the railings below in front of my horrified Grandmother. Who knows what horrors Francis lived through and witnessed during the great war, which may possibly have preyed on his mind. Austin served with the Merchant Navy during WW2, he also served before and after the war. I have found records showing that Austin sailed on " British Tradition " and " La Pampa " He would have served with many ships during the war. Austin lost an eye during his service. He was married to Margaret and they lived in Hopwood street. Austin was my Grandmothers brother and the son of John Owens listed below. He passed away in 1975. John was born in Bootle and was married to Sarah Anne with a son Austin and a Daughter Ellen, the family was living at 145 Burlington Street when John went to war in 1914. He served as Private 7021 with the 1st Battalion of the East Lancashire regiment with who he had served before in India. His regiment was present at the famous Christmas truce of 1914. John was involved in fierce trench fighting before sadly losing his life on 13th May 1915. He is remembered on the Menin Gate memorial in Belgium. John is the father of Austin listed above. John is also remembered on the war memorial at Our Lady of Reconciliation church, Eldon Street, Liverpool. Bob Paisley joined the 73rd Regiment of the Royal Artillery. He served with Montgomery's Eighth Army, the so called Desert Rats at the relief of Tobruk and the watershed victory at El Alamein, as an anti tank gunner. Whilst Bob was on active service in Italy he was given the news that his younger brother Alan had died back home at the age of fifteen from scarlet fever and diphtheria. On hearing this news, Bob wandered aimlessly away from where he had been positioned, understandably dazed and upset by what he had heard, and moments later a shell dropped and exploded right where he had been. The tragic news had ironically saved his own life. In June 1944 he proudly rode aboard a tank as the Allies liberated Rome. It was a proud moment as the relieving forces were welcomed as heroes by the Italians. For Bob and his fighting comrades it was the beginning of the end of the war, a war that had given him an early insight into the Scouse character, for many of the men in his regiment were Merseysiders. Bobby Parker's story could have rivaled even that of Dixie Dean's had it not been for the outbreak of the First World War. Everton needed to add a spark to a team that finishing runners up in the league in 1912 then tumbled to 11th and then 15th in the next two seasons, Parker was to be what was needed. Signed from Glasgow Rangers in November 1913 he scored on his debut against Sheffield Wednesday and ended the season with 17 goals in 24 games. Season 1914-15 was to be a massive turn around in Everton's fortunes, after winning only two of the first six games the club went on to win their second league title. For Parker the season was a personal success as he finished the countries leading scorer with 36 goals in 35 games, including six hatricks. What made Parker's exploits even more impressive was the fact that the offside law had been changed and that three players had to be between the player receiving the ball and the goal. 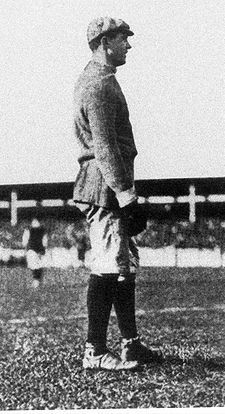 Bobby Parker was robbed of the best years of his football career due the war but even worse was that he returned to Everton with a bullet lodged in his back and this prevented him capturing the heights he had reached in 1914-15. He played just 25 more games over two seasons, scoring eleven goals, before he left to join Nottingham Forest at the end of 1920.
nearby. As kids we used to stand on opposite sides of the crater throwing stones at one another. What fun! which shows one of these mines in someone's back garden. It's enormous - no wonder ours caused such a huge crater! They must have been dropped the same night in the same area. I also once found the tail fin of an incendiary bomb which I hid under the hedge in our garden. Some sneaky kid snitched on me and my treasured tail fin was confiscated and disposed of. I was allowed to keep the shrapnel I collected, but where is it now? Another time Two adjoing houses were destroyed by a stray bomb, but nobody was killed or injured in that incident. 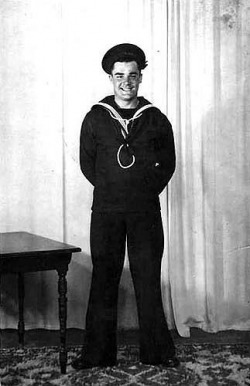 On the other hand a near-neighbour, Norman Stringfellow, a firefighter, died in the Blitz and, worse still, another former resident, Leslie Mollard, was one of the evacuees drowned when the City of Benares was sunk on its way to Canada. I often wonder how his parents coped with that devastating tragedy. Both these individuals are remembered in the CWGC website where you can find the precise dates etc. It is interesting to see how even a quiet suburban road away from strategic targets could be profoundly affected by the war. James Pollitt died at the age of 84 after suffering severe blood loss during a bombing raid on the night of the 16th of April 1941. He was sheltering under the stairs in his home at 35 Saunby Street in Garston, with his daughter Phoebe, her husband Peter and their first child Edith, when a bomb dropped on the houses opposite. Phoebe, Peter and Edith were unhurt but unfortunately James was badly injured. He was admitted to Rainhill Hospital, a converted asylum, where he died on the 27th of April from his wounds. James was born on the 1st of December 1859 in Halton, Runcorn. He had worked most of his life for the Garston Tanning Company, working well into his seventies. At the age of 76 he went blind with cataracts and had to give up work. James is buried with his wife Elizabeth and Grandaughter Joyce Williams in Allerton Cemetary, Liverpool. Submitted by his Great Grandaughter Karen Millea. My Father spent six years in the Orphanage, received a good education & was clothed & well fed, also he learned to play the Trombone and was in the Orphanage Band and competed with other bands around Liverpool. After leaving the orphanage he and another home boy wanted to join a band, so both ended up joining the Territorial Army as band boys with the old 87th Field Regiment, Royal Artillery at Wellington Road barracks Wavertree. This was in 1923 when my Father was 17 years old. At the start of the war in 1939 being in the Teritorials he was among the first to be called up, first being sent to a camp in Delamere. He didn't stay there long before being sent to Suffolk to guard the coast in case of an invasion. Then he was up and down the country while they decided what to do with him. 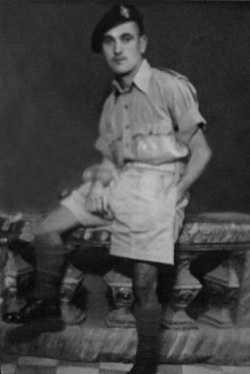 Then on the 8 / 12 / 1941 he embarked for overseas, first to India staying at Bombay. My father kep a diary of his life and here is his ww2 record in his own words. We stayed at Bombay until the ship was ready, " what a place that was " we had to move about in small parties and report back to the ship at 9pm. We were there five days which was long enough,Then it came time for us to sail again. So off we went, landing at a place called Basrah in Iraq. Now this was a place for filth and disease it was thick with it, Just as we got there a small war was going on so we lost no time loading our stores onto lorries for the battle area in Iraq. We were put on trucks with loaded rifles but a small bunch of our lads had to stay with fixed bayonets to stop anyone coming near the stores. Quite a few were killed too, swarming all around us waving knives and old swords till we had to fire over their heads before we could drive them away. They were trying to stop us getting to our troops fighting the last of the Iraqian Army which we were told was still strong. We stopped in the desert and put up our tents and had a small meal, next thing we were surrounded by men women & small children, we grabbed our rifles expecting an attack, but all they wanted was food, they were starving. An officer went out to persuade them to go away but they all swarmed around him. Then we were ordered to fire over their heads which moved them back a bit but they were still watching us. As soon as the cooks buried the swill the women and girls made a dive for the place digging and scratching at the earth to get at the swill. They were all fighting each other, some half naked, what a sight that was. After a while some of our chaps had to go to them with whips and sticks and beat them away for even without food there were millions of flies and the country was full of dysentry and malaria. But the whipping never chased them away so a troop of the Poona Horse was sent out riding at them with drawn swords, that very soon cleared the place with not a person in sight. As night came we had to pick men for outside picket and men for inside picket. The outside picket had chains tied to the rifle trigger guard and to their wrist as we had been warned Arabs would sneak into camp and steal anything they could. That night some chaps had their wrists cut and rifles stolen, some even stole blankets and clothing while our lads slept. Things got so bad with so much stolen that a body of men ( me included ) were sent out to search every hut in every village for Army stores. In a village called Zubair we found some blankets in the first hut, the next hut they put up a fight and one of our lads was knifed, three of that family were shot including husband wife & daughter. We found rifles and other stuff there. The next hut also put up a fight so we set fire to their hut, the next hut was more difficult with the man saying the woman was expecting a baby, but we went in anyway. The woman was completely naked with a huge belly lying on a heap of filthy black clothes, our sergeant told them to move her off the bed, but they were protesting strongly, but with the threat of the Police or burning their hut they then moved her. Moving the clothing with our rifles in case of disease we found Rifles, Ammunition, Boots, all kinds of Army equipment, the man was then handed over to the police. In that country anyone who steals is either beaten to death or one of his hands cut off, and that is what happened to him. After a while we moved up to Persia, a lovely country for scenery, all was quiet for a while until one night a band of Brigands came riding down from the mountain and rode straight thru our camp, firing as they rode. They were known as Kurds with their long hair and wicked looking broad swords slashing left and right. we killed some also their horses. Next they formed up again ready to make another charge, with that we fired everything at them, even the Field Guns at point blank range, that did the trick. Those that were left we went around and shot those that were almost dead, the slightly wounded we took to our MO. For a week all was quiet, but we were all on edge knowing they might attack again. Then one day a company of Gurkha's came and camped near us, so we knew they were taking precautions.Then it came, one afternoon after tea we were cleaning our rifles when suddenly shots came in our direction. we made forcoverlooking to see where the shotswere coming from, they were up in the hills and we were in a bad position in a valley, they had the advantage, our rifle fire was no good So the order was given "man the guns " and blast the hills from under them. After that it went quiet then the Gurkha's were sent in to chase them "and they did " these small sturdy soldiers with their "Kukri" the deadly knives they carried which could cut off a mans head in one blow, they soon put those Kurds to flight. Again moving on we came to a place called " Kirmasha" we were allowed to look round the place but they were all pro Nazi's so we had to go about in numbers. The people wouldn't even look at us and moved off the pavement away from us, even children would shout and throw stones at us. We never went near the place again, but a few headstrong lads went after women and where brought back next morning by the Police, having been stabbed and left in the gutter for dead, with most of their clothes stolen, so that was a warning to others. Moving again, sometimes we were up in the mountains in a foot of snow, next down in the valley the sun would be so hot we took off our shirts. March 1942 we were just below the Pittang Pass andwe all went for a swim, but I got caught in strong currents and nearly drowned, luckily I was saved by the Colonel of the regiment who I was Batman for, I was forever grateful to him after that and was always there at his beck and call. One day he went off to Baghdad for a big conference, when he came back he had been promoted to Brigadier making him Corp Commander and "If I wished to go with him he would be much obliged . As I had been with him so long I said " yes Sir " with that we started packing to make our way to the Western Desert where he was to take over the famous 10th Corps which took part in all the fighting through Egypt. This was a day to remember for me having been with all the boys of the old 87th Field Regiment since 1923. The Brigadier called a parade to sadly say farewell to all the boys, saying he had plans for them to show their worth in the Western Desert, but the War Office had other plans. So they were left in that "Hell Hole " called Iraq for the rest of the war, with all the filth flies and disease. I thought I had seen the last of that life, "but not so" I was to endure much worse conditions. Arriving at Baghdad after a terrible journey over bad roads and on out of date trains, we did not stay long, for on arriving at headquarters they had everything ready for us to travel on. when we got inside HQ the General came to meet us. I was surprised when I saw him,"I knew him " he was once Adjutant to the old Regiment the 87th some years back. The three of us went into the officers mess and enjoyed a lovely meal ( first for ages ) the General then ordered the waiter to prepare some meals for our journey,the General then gave the Bigadierall the info on the battle front saying how bad it was for us. After the meal we had a wash and brush up then a car came for us to take us to the plane for our flight to Egypt,. It was my very first flight in a plane and it was a wonderful trip. We landed at Egypt on an airfield near a very large Royal Artillery depot, it was named Almaza which is in Cairo. we got fixed up with a billett and seeing that the Brigadier had everything, as we were moving out the next day for Alexandria. On going to he canteen for some cigs I listened to all the lads gossip about Cairo and the good and bad things about the place, but mainly the bad. I called to see the Brigadier before dinner and he told me we would be calling at Damascus first and then Alexandria, so it will mean an early call for a two day trip across the Trans Jordan Desert. Well I got to bed early so I could be up at 4 am next morning to pack mine and the Brigadiers things, and also have breakfast. To cross this desert we had to travel in civilian transport which were long buses which had to be air cooled. We had two days rations with us so off we went stopping while the driver made tea for us for breakfast next morning, we were the only soldiers on board the rest were all civilians. Wewould sit in a circle to eat and drink chatting away to each other, the next day was the same. At last we arrived at Damascus in Syria and found a hotel, I also stayed there with the Brigadier and had some good food "and a bath" then straight to bed, and did I sleep. where this Corps was resting, we were only at Alexandria two days. One half a day I spent buying a present for my daughter Margarets birthday on the 5th October, asking a lady at the YWCA would she post it off for me. When I got back I found the unit all ready packed for the journey to the Western Desert, never did I realize what we were in for. We got out of the town and on to the desert road, all went well for a while then it started "Jerry planes "those dreaded Stukas, not just bombing but machine gunning up and down the long road " it was hell while they were up there " Some chaps dived out to the side of the road onto the sand but they would come back and spray the sides knowing the chaps would dive out. At last it ended but we had many casualties, drivers and others- the canvas tops on the lorries were no cover, they were just like paper boxes riddled with holes. Most of us escaped " God only knows how " I know I got one on my tin hat which almost knocked me down with the force. Two got hit in our truck with one dead. as many of us as possible. The tea was boiled by filling a tin with sand and petrol with a tin full of water to light this you threw a match into the sand then stand clear! as the flames would shoot up. when the water boiled you threw a handful of tea into the boiling water. The tea would taste of petrol but we got used to it after a while. Then we were off again till we reached a place called Berkalarab, got our bearings then off to Beach Head, there we knew we were in the battle area. Guns were placed in position, trenches were dug, officers and men all working together- we were now miles away from civilization and we were here to stay in that sandy waste called Desert. We could see the Infantry, hear his guns, from then on each man was your brother. At that time things were going very bad for our troops and Jerry was having all his own way, some of our guns and equipment were old and out of date, also our planes were few. We all knew as we waited that all hell was about to be let loose. The storms were terrible too just mountains of sand blown towards you covering everything, also swarms of flies that would make day look like night, sticking to your skin, in your eyes, in your mouth. Your face, your knees, would be stinging with the sand blasting against you, and your eyes would be blinded by the sand. This went on each day we spent in that desert, just like rats that scrambled about. At night it was like winter, and had to wear your overcoat, also you had to watch out for the deadly scorpion. I am afraid words could not describe the conditions of a desert soldier during that campaign. Someday maybe a film may be shown to show those conditions we had to suffer, nowhere to helter from the sun, or to hide from the bombing & shelling, only a hole in the soft sand. My Father is sitting on the right at the front, it looks like a bandage around his neck? but he never ever mentioned being wounded. On the back he has written Jock, John, Leslie, Vic, & myself C C R A Branch, taken 29th October 1942, the battle of El Alamein was on the 23rd October 1942. This is as far as my Father got with his story, and he was right when he said that "all hell would break loose " for what he describes were the preparations for the battle of El Alamein. what I can tell you here is that on the evening of Friday 23rd October 1942 at 21- 40 hrs ( 9-40pm ) was the start of "Operation Lightfoot " in which the Royal Artillery gunners were to fire the largest barrage of gunfire since 1918 against Rommell and his Panzerarmee. I will not go into actual detail about this action here, but would just like to tell you a few things about the gunners. My father said he was on the 25 pounder gun Montgomery had massed 834 of these guns including 48 other medium pieces, the gunners had the task of loading & firing at least 600 rounds for each gun during that night. Victory came at dawn the 4th of November, the germans were on the run but there was still lots more fighting to come. Some enthusiastic soldiers remembered next day was 5th November and were determined to have their own Guy Fawkes day by firing off german signal rockets in all directions. I can remember as an 11 year old when the news reached home, the church bells that had been silent now rang out over Liverpool. But it had been gained at the cost of 2,400 British killed, 9,000 wounded & about 3,000 missing, from an Army who's strength was abt 195,000 men. El Alamein was the first of a chain of victories, one that would give hope to the people of Britain. During that war I can remember how excited we were to receive a letter from my Father, ( censored as usual ) we would follow the movements of the Eighth Army in the daily newspapers. I was very proud of my Fatherm and always have been, and I miss him very much. The day we knew he was coming home Mum let me stay off school, I was looking out for him skating along on one skate, then I saw a taxi with this soldier looking out of the window, he was very sunburned with a beard and moustache ," It had to be him " I tried to keep up shouting "Dad" "Dad" I reached our house as he was walking up the path with his suitcases, I followed him into the house my Mum was standing by the kitchen, Dad dropped the cases and said "Hiya Kid" ( his pet name for her ) I will never ever forget that touching scene as they embraced each other. Also I remember how he would sit in front of the fire wearing his Army greatcoat. He was demobbed from Neath West Glamorgan where he was a Gunnery Instructor. I can remember when he came home asking him dozens of questions about the war, but he wouldn't tell me anything, and would avoid talking about it. Sadly I don't have his medals because my Mother being short of money in a mad moment sold them in the local market. If only she had asked myself or my sister. All I have now is his pay book, Identity Tags, a piece of medal ribbon, not much to show after 22 years service 1923 to 1945. But pleased to say I have loads of photographs from his Army days. My uncle John was my Fathers younger brothe, both were orphans, my Father being put in an Orphanage in 1916 where he spent six years. His brother John was looked after by an Aunt who had a large family living in a " Hovel " Like my Father John entered the building trade. Later he also joined the Territorial Army, his unit being 424 Battery 106 Regt R H A, at Shaw Street in Everton. At the start of WW2 he was a Sergeant. In May1940 he was in Palestine, and later fought at Crete. From what I have read they had a very rough time of it, as during the final phase of Hitlers Balkan campaign using 1,390 aircraft ( JU 52 ) The German paratroopers landed on Crete with many shot as they came down, but the attack was decisive in the capture of Crete forcing the British to withdraw on the 27th of May 1942 after three weeks of stubborn resistance. I heard that our troops had to escape over the mountains to the sea where the Royal Navy was waiting to rescue as many as they could. My uncle John was invalided out shortly afterwards diagnosed with a condition known then as Neurasthenia caused by extreme stress, but really it was post- traumatic stress disorder. He also suffered with Angina and had to take a tablet every day. At this time I was only 11 years old but I remember uncle John being a big well made man, loved to live life to the full, and also worked hard. He loved a drink and enjoyed a social life eachweekend, he also had a great singing voice and played guitar. I ooked up to him in a way. Sadly I never got around to sitting down and having a good chat with him. By 1950 I was in the Army myself at 18, but later in 1968 we were working for the same building firm and as luck would have it we spent one lunch hour together and I told him about me always wanting to have a chat with himand he replied " there have been too many wasted years Edward "
Later he moved to another job using a heavy Jack Hammer, there was a bus strike so after work he walked from Park Road in Toxteth all the way home to Huyton! then suffered a heart attack, he insisted on walking out to the ambulance, and on reaching the hospital he had a fatal heart attack, and died age 59 yrs. His son also John said he was forgetting to take his Angina tablets. My great uncle Percival Pritchard who was born c 1890 in Everton, and married Helen Murray 20/4/1915. He had joined the Royal Welch Fusiliers as Private 18474, and sadly was killed on Saturday 11/12 /1915 Aged 25 years at Gallipoli. His name is on the Helles Memorial, Panels 77 to 80. I have all the documentation plus the large medal with his name on it which was passed down to me through the family. 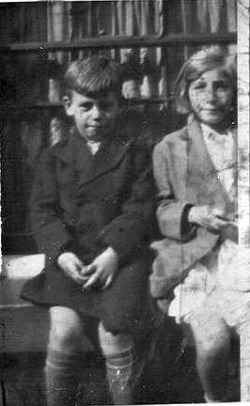 The photograph shows myself and my sister Margaret outside 85 Field Street, Liverpool just before evacuation. I wa 8 years old when war started and my elder sister and I were evacuated from SFX school to Colwyn Bay. Dad being in the TA was called up right away, and we never saw him again until 1945. Mum had told my sister not to lose me, so we set off for Lime street station with big sister clinging hold of my hand. Mum and my younger brother went to a family in Wrexham. Leaving our school we all had a label tied to our coats, on it was our names and destination, also we each had a gas mask in a cardboard box slung over our shoulder.M y sister had a small brown suitcase while I had a haversack. On arriving at Colwyn Bay we were all led along a long Pier, mysisterstilltightly holding my hand, and I can still remember looking down through the gaps in the wooden planking and seeing the water.we then arrived at a line of tables where WRVS ladies were sitting. We were each given a brown paper carrier bag, and as we filed past the ladies gave us different items of food,soap,chocolate, etc, but I am unable to remember exactly? Next I remember my sister and Ibeing taken around thes treets of Colwyn Bay by a Salvation Army lady who was trying to find a family who would take us in.Most only wanted one child not two, but my sister insisted we stay together.It was getting late and starting to go dark when the Salvation Army lady said " I know who will take you " "MrsHughes " We arrived at a house in Grove Park No 4 or 5 I think? andt his lovely old lady took us in staraight away. She gave us something to eat & drink and sat us by the fire. Next she opened a cupboard full of her grandsonstoys for us to play with. We were really happy there and attended the local school where they tried to teach us to speak welsh. I learnt to count to ten and sing the welsh national anthem. My Mother would visit us from Wrexham every Saturday and take us out, then she would see uss eated at the local cinema then wave to us as she left. I can remember us all singing to the words on the screen," Run Rabbit" " Run Rabbit" Run Run Run! etc etc. Sadly our stay with Mrs Hughes was only temporary, so we were taken to stay at Penycae near Ruabon with a miner and wife and son, they were really cruel we hardly had anything to eat, and had to drink our tea with no sugar or milk, just because the father did.One day the son took us into a bedroom and showed my sister and I a cupboard stacked with all kinds of food. Another day because the woman was doing her houseworkshe made us stay outside, and it was pouring down with rain. My sister and I had to take cover under the hedge at the side of the road. Our Mother had always looked after us well even though they had very little money, we were always clean and well dressed, and taught to be polite to our elders, say please & thank you etc etc. Staying with this family we were scruffy & dirty with holes in our socks, so next time our Mother came we told her everything, and she went mad. My grandmother was there also, and she rolled up her sleaves and almost attacked the woman, threatening to tell the authorities and have us taken from them, which is what happened.Later Mum took us to stay with her in Wrexham,I enjoyed my time there ( which was short ) The family had a saw mill in huge yard cutting logs which they chopped into firewood then making bundles with elastic bands.There was a teenage girl living there who was fostered and she would sit me on top of an old pram full of firewood and wheel me around Wrexham until it was all sold.That same girl Gertie is still alive today in Wrexham and she still remembers me. Mum for some unknown reason ? took us back to Liverpool 1940 to stay with her parents at 125 Field Street. During the air raids we all went down into the cellar which had been reinforced with wooden props, and we slept on two tier iron bunk beds. My twin cousins had gone to the pictures one night and coming home later an air raid started, I can remember them rushing down the front steps to the cellar screaming with fright telling us they had just seen an Ack Ack gun and crew get a direct hit on the corner of Eastbourne Street and Shaw Street, and saw the headless bodies of the soldiers on the roof. As the bombing got worse we went to live with an Aunt near Dovecot.We first stayed with an Aunt who was the wife of my Fathers brother John Pritchard who was also away in the Royal Artillery. We attended the local school in Colwell Road which had brick air raid shelters in the playground, also we would have fire drill being shown how to use a strirrup pump. You can imagine the fun we would have soaking each other. Next we got our own corpy house around the corner, everyone was given a corrugated air raid shelter which was erected in the back garden.This had a concrete tank set in the floor for any water that seeped in, also they had four wooden bunks ( two on each side) with metal straps criss crossed to sleep on. We then had to camouflage the shelter by taking grass sods from the local farmers field and covering it. One night while in the shelter there was an Ack Ack gun firing away on the corner, we could see the searchlights showing up the German planes above us with the distingtive constant drone of their engines. My Paternal grandfather Thomas Henry Pritchard was born 1875, he was a Carter who was married with young children. He enlisted into the17th Lancers Regular Army in1899 joining for service at Ballincolig Ireland, he served in South Africa 18/12/1900 - 19/10/1902, and was awarded the Queens South Africa Medal. He then served with the British Expeditionary Force in France and Flanders from 16/10/1914 to 10/12 /1914, and was discharged 28 /1 / 1915 on ceasing to fulfill Army Physical requirements ( Tuberculosis ) Medals:1914 Star,British War Medal, and the Victory Medal. My grandfather re-enlisted 26/2/1915 with 20 Supr Co, 3/5th Kings Lpool Regiment at 79 St Anne Street Liverpool, he was again declared unfit for Army service after serving 1 year & 7 days on 3/3/1916. Description : Age 40 years, Height 5ft 9 ins, Complexion Sallow, Eyes Brown, Hair Brown. Next of kin : Sister Mrs Pearson 41 Stitt Street, Everton Lpool. My grandfather died at this address cared for by his sister and was buried 4/4/1916 at Everton Cemetery. His wife, my grandmother had died of TB in1913, only aged 37 yrs, as most of her children did before her. Walter Pritchard was born in Liverpool in 1916 to Alexander Pritchard and Margaret Wilton. His father was serving as Rifleman 2712 with the 5th Battalion of the King's Liverpool Regiment, when he was killed in action on the 4th of June 1916 near to Arras in France, he was buried at Wailly Orchard cemetery. Walter was just a few months old when his father died, it is unlikely that the two ever met each other. Back at home in Upper Stanhope street in Liverpool, baby Walter, his three year old sister Mary, and their mother Margaret had to carry on. In 1920 Margaret remarried Alexander Htchinson in Liverpool, they had three daughters, Ann, Elizabeth, and Margaret. The family lived at 32 Simpson street, where Mary helped her mother raise the children, and the girls must have doted after their only brother Wally. Walter was educated at St Vincent’s De Paul school, upon leaving he trained as a French Polisher and also worked as a delivery driver for Lyons Bakeries. He was a big Everton fan and also played for an amateur football club called Simpson United, they were based in the billiards club right next door to where he lived in Simpson Street. This billiards club was badly bombed during WW2 and the family had to move out because of the damage to the party wall. 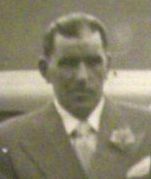 Walter married Catherine Anderson in Liverpool in 1937, his best man was his cousin Mickey Costello. Walter and Catherine lived above Catherine’s mums Haberdashery shop in Park Lane. They had two children Janet ( Christened Catherine Janet ) and John, later Catherine gave birth to a third child Emil. During WW2 Walter served with the 10th Royal Hussars as Trooper 3716882, he went right through Egypt and fought at El Alamein. His regiments last battle in North Africa was as the right flank guard to the joint attack on Tunis to end that campaign in May 1943, they then rested in Tunisia before being called forward for the invasion of Italy. They sailed into Naples on the 27th of March 1944 aboard the Durban Castle, their tanks came ashore at Taranto. At first they were in a camp a few miles outside of Naples, before moving by train to a position twenty five miles south of Bari. While in Italy the 10th Hussars were attached to the 2nd Brigade of the 1st Armoured Division. When news of the D-Day invasion reached home, Walter's sister Margaret was convinced he was taking part in it all. She visited her friend in Simpson Street and they sat in the doorway waiting for news about him, of course he was in Italy, but they would have had no idea about this. 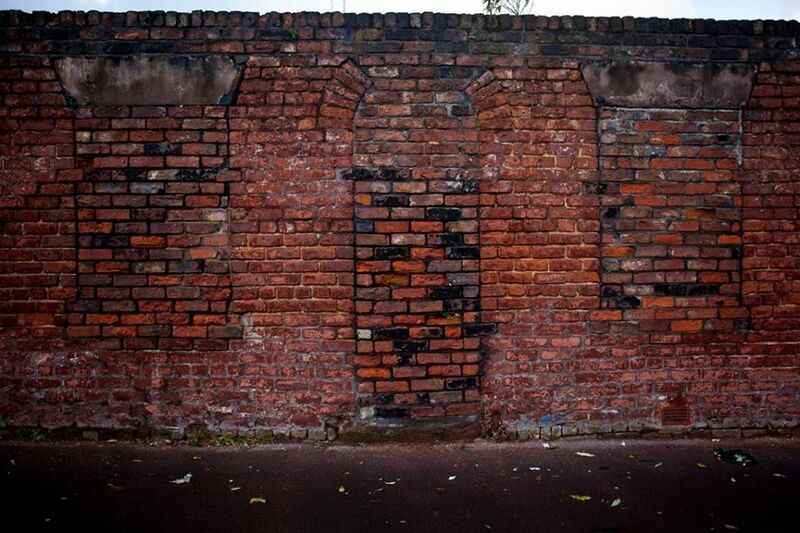 The photo shows the bricked up house in Simpson Street where Walter's sister Margaret sat in the doorway with her friend waiting for news about her brother, believing he was involved in the D-Day landings. Just four weeks after his arrival in Italy, Walter died on the 20th of June 1944, he was buried at Bari war cemetery. The circumstances surrounding his death remain unknown, the family believed that he died in an accident and that the army were keeping details from them. Walter's mother was told that that he was driving an Italian POW back in an armoured when crashed or turned over, but they don't know if the prisoner did something or if it was just an accident.The regiment was involved in no battles around the time of Walter's death, and no air raids occurred as by that time the Luftwaffe were all back in Germany. The only conclusion is that Walter died by accident or from illness. His cousin Mickey Costello, the best man at his wedding, was in the Royal Engineers and was only a few days behind Walter right through the fighting in Egypt, Mickey kept missing Walter by a matter of days as they moved up through the fighting. When he got to Bari Mickey found that Walter had died only days before. In recent years Walter's sisters Margaret and Elizabeth made the journey to Bari in Italy to visit their beloved brother. Grave of Walter Pritchard at Bari War Cemetery. The family fondly remember Walter for the wonderful man that he was, and are very proud of his service. Forever loved. Submitted by his sister Margaret and his niece Alix. John Herbert Radley, a/k/a Jack, served during the build-up to WWI as a Private with the Army Cyclist Battalion, McTetra branch. 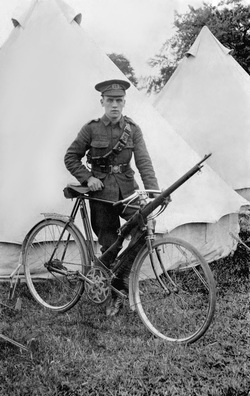 The British Army Cyclist Battalion was active during the First World War and controlled the Army's bicycle infantry. The Army Cyclist Corps was formed in 1914 and absorbed the pre-existing cyclist battalions from the Territorial Force. 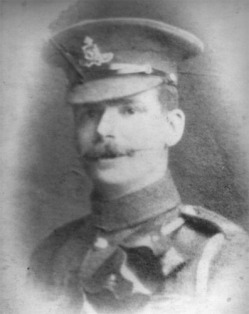 Jack was from Hough Green and served for three years sometime between 1907 and 1914. In 1914 he boarded the R.M.S. Baltic for his second voyage to the United States and settled in Connecticut. Jack's four sons, John Eustis, Legrand Hughes, Earl Adrian and Donald Radley all served in WWII, representing both the US Army and US Navy. At one point all four were in service at the same time. My father, Legrand Hughes, as well as my mother, Patricia Lee Rile, were stationed at Pearl Harbor when it was bombed. My dad was on the USS Vestal, a repair ship that was next to the Arizona. My dad and mom, as well as all my uncles, survived the War. When I first saw this photograph of my grandfather, I didn't understand how he could be serving in a war on a bicycle. Thanks to a community of people interested in the Army Cyclist Corps, I have learned that in the early part of the war, they were scouts and a sort of cavalry performing reconnaissance, carrying messages and acting as military police and a mobile infantry. 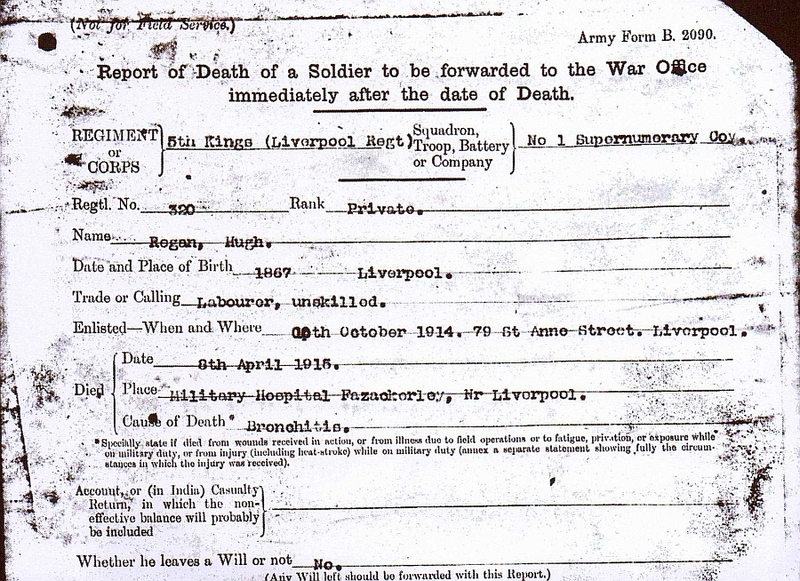 My Great Grandfather signed up for service as private 23711 with the Liverpool King's regiment. He was in his late forties when he signed up and the king's regiment probably considered him too old for service overseas, so he was transfered to the Royal Defence Corps as private 19434. The RDC was made up of old soldiers who were beyond the age set for combatant service, or those who were not fit for duty overseas, sometimes as the result of wounds received on active service. The Corps was similar in some ways to the Home Guard of the Second World War. Its job was to guard railways, tunnels, roads and ports, thus relieving other troops for front line service. John was later moved to the Fusehill War Hospital in Carlisle. I am not sure why? injury or illness. It is now a campus, but the original building is still there. The hospital was a General hospital and taken over for wounded and sick servicemen during both world wars. Sadly He died here on 20th May 1917, aged 49, and is buried at Dalston road cemetery in Carlise. My Great Grandfather Hugh Regan was born in Liverpool in 1866, he was one of ten children to Hugh Regan and Mary Keogh. All the children were baptised in St. Joseph’s Church on Grosvenor Street, the family lived in the Mansfield st area. Hugh found work as a Labourer on the busy nearby docks. In 1879 Hugh Married Emily Murphy and they went on to raise a family, sady in 1907 Emily passed away, the death certificate gave her address as Comus Street, close to St Joseph's Church. Hugh's Mark on his enlistment papers. Thomas lived at 152 Bond Street which was adjacent to Eldon Street, where Our Lady's is situated. He was the third eldest of a family of 4 brothers and 4 sisters. 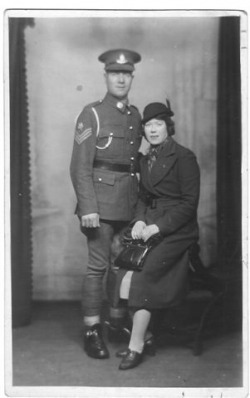 I can remember that my mother told me that he had enlisted when he was under age, joining the South Wales Borderers as private 46423, and she could recall the day when her mother (my grandmother) received the telegram informing of his death. 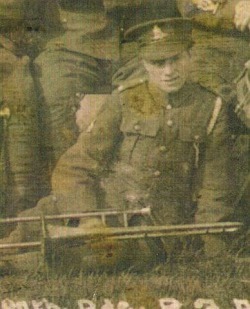 Thomas died on 13th April 1918, aged just 19. . I have a copy of the telegram which my grandmother received notifying her of Uncle Tom's death and a receipt for the 15 shillings which she had to pay to the army for the stone put on Uncle Tom's grave. Our family who are now spread around the country meet up once a year at Our Lady's Eldon Street Church for a reunion mass. Thomas is buried at Longuenesse (St.Omer) Souvenir Cemetery, France. He is also remembered on the war memorial at Our Lady of Reconciliation church, Eldon Street, Liverpool. Three sons of John and Lucy Roberts, perished at sea 1941. Unmarried, all had been sailors virtually from the time they left school. The brothers had attended Haygreen school, Wavertree. Their father before them had also been lost at sea in the North Atlantic; John Roberts missing at sea. Ship - 'Derville' - vessel missing. Last response, leaving St.Anthony,Newfoundland,15th Oct,1925. heading for Malaga. A strange twist of fate saw John's sons also perish off the coast of Newfoundland. Under the command of Heinrich Schonder, 3 British ships were hit in June 1941, including 2,379 ton ship Arakaka. which the brothers sailed on. ROBERTS, Able Seaman, JOHN, S.S. Arakaka (Liverpool). Merchant Navy. 23rd June 1941. Age 24. Son of John and Lucy Roberts. His brothers Stanley and Leslie perished with him. ROBERTS, Sailor, LESLIE, S.S. Arakaka (Liverpool). Merchant Navy. 23rd June 1941. Age 21. Son of John and Lucy Roberts. His brothers Stanley and John perished with him. ROBERTS, Able Seaman, STANLEY, S.S. Arakaka (Liverpool). Merchant Navy. 23rd June 1941. Age 26. Son of John and Lucy Roberts. His brothers John and Leslie perished with him. A log book from the Arakaka listing the brothers' names. And below their entry on the CWGC website. The first ill fated UK weather ships. R.J. Ogden. The need for weather observations from ships at sea was first recognised by the UK government in 1854. A meteorological statist was appointed which lead to the birth of the Met Office. Foundations were laid for what became the Voluntary Observing Fleet (VOF) which became an invaluable contribution to meteorology. From 1912 onwards, the use of wireless telegraphy made it possible to collect VOF data in real time, and after WW1, ship observations played an important role in synoptic analysis. In 1939, British and French meteorologists agreed that armed trawlers or submarines should be designated as observing platforms. The Admiralty view, was that the use of merchant ships for weather observing, was impracticable because the need to break W/T silence would add significantly to the already considerable dangers. It was decided that the weather ships should be able to achieve at least 10 knots, have a range of 3,000 miles and be equipped with W/T and armament including Asdic and depth charges, having a dual role as weather ships and U-boat hunters. The Admiralty refused permission for weather ships to sail under the white ensign and thus be armed; in a complete reversal, they said merchant ships would be chartered on a contract basis, making owners responsible for crews and stores etc. The Admiralty notified charters of SS. Arakaka and SS. Toronto City. It was agreed that these new ships would be known as Panthers. The Arakaka was a shallow-draught boat which usually operated in the Demerara river area of Guyana. A strange choice for service in the North Atlantic in winter conditions. Shortly before the first sailing, DMO sent a memo to the Admiralty seeking assurance that the ship would 'not constitute an easy prey for the enemy' - this heartfelt appeal appears to have been left unanswered. The voyages were to last 3 weeks. The Arakaka first sailed Sept 1940. However, In Oct, the Admiralty decided that the next voyage would terminate in Newfoundland, and that ships would use St John's as base port, returning to UK only after 3 months; this revised plan implied longer spells in the danger area mid Atlantic. Between Sept 1940 and May 1941, SS. Arakaka completed 5 voyages. It set sail for it's 6th from St John's in late May. The last signal recieved from it was June 22nd. Similarly, SS.Toronto City completed 6 voyages between Oct 1940 and June 1941. Setting out on it's final voyage later that month; it's last message dispatched July 1st. Both vessels disappeared suddenly within 10 days of each other, neither was able to send a distress signal of any kind. In 1945 the Admiralty were asked for more information on the fate of the two ships; like so many previous letters, this seems to have been unanswered - both ships simply listed as missing presumed sunk. More than 40 years later it was discovered from German records, by Adrian Gordon (ex- Met Office), that SS.Arakaka was sunk by submarine U-77 on June 22nd 1941. and SS.Toronto City by U-108 on July 1st 1941. The Panther operation was highly classified and remained so for over 30 years, only declassified in 1975; detailed reports covering work, problems, difficulties experienced, etc. eg; on no fewer than 4 seperate occasions during one voyage, the flat-bottomed Arakaka was rolling at angles of 40 to 45 degrees during periods of black-out, ventilation of the office on the Toronto City was not permitted because the noise disturbed the captain. One gratifying feature of the official Met Office history is that it does recognise the sterling work of the Panther staff of the Arakaka and the Toronto. It is thanks to Adrian Gordon's perseverance that the details of the Panthers has been unravelled. Photographs of the three Roberts brothers as boys. We are uncertain who is who. Private 26333 Christopher Rodaway. South Lancashire Regiment. Enlisted 4-10-15 at warrington, aged 19 South lancs regt[depot] Occupation - mill hand, religion, CofE. Posted to 7th battalion and embarked from folkestone on 10-3-16,sent to etaples the following day, posted to D.coy in the field, on 27-3-16. On 8-7-16 he was slightly wounded by shrapnel in the forearm,while attatched to the 56th trench mortar battery, passed to 58th field ambulance then the 1st canadian general hospital, Etaples the same day, then sent to 6th convalescent depot on 11th july. 27-7-16, posted to 2nd battalion. 4-11-16,sent to the 76th field ambulance with myalgia, then to the anglo american hospital, then put aboard the hospital ship for england on 14th november and admitted to 3rd southern general hospital, Oxford on 15th november, discharged to convalescent leave on 30th november before returning to france on 26-1-17. 10-3-17 till 17-4-17,attatched to 7th labour coy,ASC. Then on 5th aug 1917, a bullet penetrated his head and he recieved a bullet wound to his left hand. He was evacuated to the 46th CCS at mendinham, but died two days later. on 14th november 1917, a grave registration unit informed his family that his grave had been recorded and marked in mendingham british cemetery. Christopher had resided at 29 warburton st, liverpool, with his parents George and Margaret, his grandfather Henry Rodaway, brother John and sister Louisa. His grandmother mrs Margaret Downs lived at 32 warburton st.
His married sister Emma Butterworth lived with her husband Alfred at 8 Brook Myers st, Liverpool. His uncle, Walter Rodaway at 12 curzon st, Liverpool. Christopher's mother recieved his war+victory medals on armistice day 1921. August 1914 : in Tidworth. Part of 7th Brigade in 3rd Division. 18 October 1915 : transferred with the Brigade to 25th Division. 26 October 1915 : transferred to 75th Brigade in same Division. 21 June 1916 : transferred to 64th Brigade in 21st Division. 30 June 1918 : transferred to 89th Brigade in 30th Division. 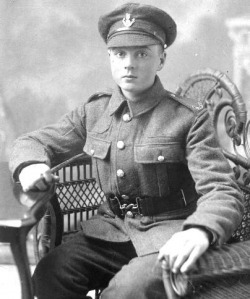 Frederick joined the 4th Battalion of the King's Liverpool regiment as Private 307255. Sadly he was killed in action on 18 August 1916. Frederick enlisted on 1 November 1915 as No 5015 in the 8th (Territorial) Battalion of the King's (Liverpool) Regt. He crossed to France on an unknown date after 31/12/15 and was subsequently transferred to 4 KLR (which was a Service Battalion) again date of transfer not known. As his number remained a TF one he kept the terms of his original enlistment. on or just prior to 18 August. Relieved 1/9th Royal Scots south- east side of Mametz Wood (6/8). To Fricourt Wood (7/8), front line south corner of High Wood (13/8), Bazentin-le-Grand (14/8) - 2 companies in trenches north-east of village. To front line (17/8). 'B' and 'D' Companies attacked (18/8) - 'C' company in support - 'A' in reserve. Objective Wood Lane - War Diary records 'survivors came in at dusk.' Casualties - 227. War Diary entry for (18/8) also records 'One man to base under age.' Relieved by 1st Cameronians and to Mametz Wood (19/8). Later to position south of Fricourt Wood. To Mametz Wood in divisional reserve (24/8), Carlton Trench north of Bazentin-le-Grand (25/8). In support of 1st Middlesex and 2nd Argyll and Sutherland at front line - working party dug communication trench to join up battalions. Relieved and to bivouacs north of Dernancourt (30/8). Troops moved into position on the night of the 17th and morning of the 18th of August, and a methodical British barrage pounded High Wood for 26 hours before the infantry attack at 2.45 p.m. on the 18th. The 4th Kings Liverpool and 4th Suffolks were to attack Wood Lane. None of the former even reached Wood Lane, due to the German barrage and fire from the well-defended German positions. Some Suffolks did reach Wood Lane, but were forced out. In High Wood itself, the 2nd Argyll & Sutherland Highlanders attacked, but suffered from the British bombardment, which also damaged the flame-throwers, and the 'pipe-pushers' did not work as hoped. However the Highlanders advanced, and despite losses from machine-gun fire, some did reach the German trenches - but again could not hold on there. Whilst there was some success to the north-west of the wood, where the 1st Loyal North Lancs gained and held some trenches, once again there was little success in High Wood itself. Over the next few days there were some skirmishes, and on the 24th of August a smoke screen and machine gun covering fire helped men of the 100th Brigade take trenches near Wood Lane. The covering machine gun fire was co-ordinated by then Captain G.S. Hutchison, who later wrote Pilgrimage, in which he also described his experiences during the 14th and 15th of July attacks on High Wood, as well as his return to the spot several years after the War. Private 10206 John Rodaway, 2nd Loyal North Lancashire Regiment, and M/41350 ASCJohn served in east Africa with the 2nd bn loyal north lancs, when the battalion moved down to south Africa for rest due to the numbers going down with different illness's john stayed behind along with about 180 fit men. He finished the war in the asc. 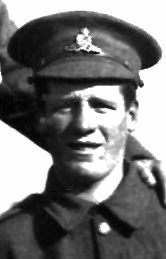 born 1893 liverpool, eldest son of frederick. .
John was a Lance Corporal at one time, and was listed as fighting with the Mounted Infantry Company, from the SALAITA action up to the company's disbandment on the LUKIGURA RIVER 4/7/1916. He could have gone in to ZULU COMPANY or THE LOYALS M.G.C. He was in the mounted infantry from its inception, and may have served in COLES SCOUTS before that. On 14.sept 1915 the mounted infantry under CAPT GEORGE ATKINSON L.N.L .REG fought a very successful action 7 miles southwest of MAKTAU. They worked with100 riflemen of the 130 baluch under LT WILDMAN. An ambush was laid on a known German route, the first sign was 5 buck running across the killing ground. Two minutes later about 60 German troops appeared, the MI COY and the BALUCH opened fire at 100 yds range, and advanced to within 22 yds of the grounded enemy & fired again, LT WILDMAN led a BALUCH bayonet charge into the killing ground, but was killed in the action there. The unwounded German troops fled leaving 32 dead behind. INFO HARRY FECITT L.N.L.REG, . August 1914 : in Bangalore, India. 3 November 1914 : Landed at Tanga, German East Africa, with the 27th Indian Brigade. Moved to Mombasa on 7 November and commenced operations in East Africa. Moved in May 1916 to South Africa, to allow for recovery from mass ill-health. 18 January 1917 : Moved to Egypt, landing at Suez. 14 April 1917: attached to 232nd Brigade in 75th Division. The Battalion was moved in rapid succession to the 233rd and 234th Brigades of the same Division, and then detached as a result of a medical board on 9 August 1917. Proceeded to Sidi Bashr and then placed onto Lines of Communication at Gaza. 27 May 1918 : Moved to France, landing Marseilles. 4 June 1918: attached to 94th Brigade in 31st Division. 28 June 1918: transferred to 101st Brigade in 34th Division. Lance Corporal 12519 Walter Rodaway, South Lancashire Regiment. Younger brother to Frederick born 1881 Liverpool. 9TH Service Battalion , Over to France 6-9-15 Discharged 11-5-1919. The 9tTh were formed at Warrington in September 1914. Moved over to France on 6 August 1915, then to the port of Marseilles 29 October 1915 were they sailed for Salonika, arriving on 5 November 1915. An Armistice with Bulgaria was signed on 30 September 1918. By 18-20 October, units of the Division had marched back to Stavros. Here they embarkedon destroyers with the intention of a landing at Dede Agach to continue the fight againstTurkey. After one attempt was called off due to rough weather, the infantry finally landed on 28 October 1918. On reaching Makri, the Division learned that an Armistice with Turkey was imminent. Demobilisation began at Chugunsi and the Division ceased to exist by 31 March 1919. WILLIAM was discharged underage after serving in France and Salonika with the Cheshire regiment aged just 15, his mother had got him out of the army. He then signed up again underage into the Manchester regiment 79184, and went back to France, finishing up in the DEVONSHIRE regiment 066, this could have been at the end of the war. He never spoke about his time in ww1 only that he was gassed, but it never stopped him smoking his woodbine's. William died in Blackpool in 1966. Attached to 84th Brigade, 28th Division, at Winchester. Landed at Le Havre 17 January 1915. 13 September 1918 : left Division for France. On arrival joined 7th Brigade in 25th Division. Formed at Exeter on 19 August 1914 as part of K1 and attached as Divisional Troops to 14th (Light) Division. May 1915 : left Division and landed at Le Havre 26 July 1915. 4 August 1915 : attached to 20th Brigade, 7th Division. Billy as he was known was the son of William.C Rodaway, Cheshire Regiment, listed above. His 2nd ship was , H.M.S. PORCHER, a Canadian built trawler from 8/mar/1945 till 13/nov/1945. Billy was released from Europa 26/jan/1946. He was home and got the taxi for my mother to get her to hospital to give me birth on 2/1/1946. Billy played the piano very well, and any chance to get ashore he was followed by the rest of his mates knowing a good time was to be had. Billy was like a dad to me, and without him telling me bits of his time in ww2 I would never have started on this wonderful family search. He was born 1919 in liverpool, and died in blackpool 1987. All of the Rodaway's lived in garden st at some time. Christmas card sent to billy from his grandmother Catherine Rodaway, wife of Frederick Rodaway, King's Liverpool Regiment. who sent letters to the army to get billys dad out in ww1. Card sent to Billys wife Annie. also 1943 saying he will not be home for Christmas and New Year. Billy arms crossed center of photo. 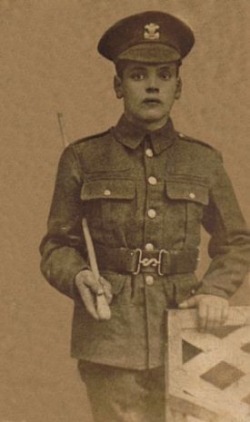 Private 4708 William H Rodaway, 8th Battalion, King's Liverpool Regiment. WILLIAM was discharged wounded , he was the son of Frederick's elder brother William born 1868. Young William was also born in Liverpool in 1897. The H stands for HENRY his grandfathers name. My Aunt Mary Roe was born in 1921 in the Dingle Liverpool, second daughter of Sarah Ann and Thomas Roe. She had worked in a munitions factory but had been injured in an accident there and was troubled by the scars on her hands for the rest of her life. She still wanted to help in any way during the war and enlisted to be a canteen assistant at an Air force base in Morecombe. During her time in Morecombe she was serving some Air force officers and accidentally dropped a spoon on one of them ! (her hands still could not grip properly after her accident), he then puts her on a charge. The officer who reported her ended up marrying Mary in 1943 they had three sons. Mary died in 1968. My Grandad Thomas was born on the 3rd of June 1890, the son of John Edward Roe and Mary Knott in Hughson Street Toxteth, In 1911 he married Sarah Ann Williams, he enlisted in the Royal Naval reserve force on the 5th of February 1912 and was discharged on the 4th of March 1932 as he was "below Naval physical standard", his conduct during this time was very good and his ability superior, he was mobilised on the 4th of August 1914 to 17th of February 1919. He served on many vessels including the Ulysses, Senator, Sculptor, Zent, Dictator, Gladiator, Student, Artist, Tactician, Colonnial, Bernard, Jerome, Isis, Bellerphon, and others. During the time he was enlisted he lost two children Sarah Ann who died aged 3 in 1918 (of influenza) and George James aged 8 months also in 1918 (of dentition), at the time of their deaths he was serving on the Bellaphon. After the war he worked for Liverpool corporation in Clarence dock Power station as a labourer, he died in 1963. 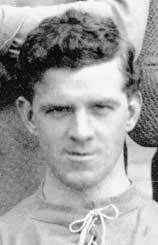 The Welsh Goalkeeper played 24 games for Everton between 1904-1905, Helping them reach the FA cup semi-final. He was killed aged 38 on 07/10/1916 whilst serving in France with the Royal Fusiliers.Although well above the age of the average recruit, Roose joined the British Army as a private of the Royal Welch Fusiliers in 1916 and served in the First World War on the Western Front, where his goalkeeping abilities resulted in his becoming a noted grenade thrower. "Private Leigh Roose, who had never visited the trenches before, was in the sap when the flammenwerfer attack began. He managed to get back along the trench and, though nearly choked with fumes with his clothes burnt, refused to go to the dressing station. He continued to throw bombs until his arm gave out, and then, joining the covering party, used his rifle with great effect." His award was gazetted on 21 September 1916. Promoted to the rank of lance corporal, Roose was killed, aged 38, towards the end of the Battle of the Somme. The exact location and manner of his death remain a matter of dispute. His body was not recovered, and his name appears (spelled incorrectly) on the war memorial to missing soldiers at Thiepval. My Grandfather Thomas Rossiter. When in the Army he lived with his young family in London. Thomas was often described as being a 'brave soldier and leader' He survived the war. Submitted by his Granson John Hutchinson and his wife June. Thomas Rossiter and family. Young Tom is standing by his father, Alfred on his fathers knee, Rebecca on his right, Edward standing between his mother and father. John Hutchinson's Mother Ann is sitting on her mothers knee, Jane Rossiter (Ellison) The Rossiter's ran a well known fruit shop 210 Vauxhall Road. Rossiter's Fruit Shop, 210 Vauxhall Road. 24th September 1935 Ref No7105 Liverpool City Engineers. Below a Fabulous Painting Of The Fruit Shop Based On The Photograph Above. As a child I loved looking at the old photographs and trinkets my Mother kept in her dressing table drawer. It was a beautiful old dressing table made of polished mahogany with the largest mirror I had ever seen. The whole room was filled with amazing things– fur coats that I couldn’t wait to grow into, handbags containing letters from a soldier who looked like a movie star. An old cardboard box containing a crucifix and candlestick holders with half used candles still in them, remnants of some catholic blessing that must have taken place here. The curiosities were endless and kept me amused for hours. Of all these items, the one that fascinated me most of all, was a small black-edged card the size of a playing card. On one side of the card was a drawing of a wounded soldier looking at Jesus. It appeared to be very old fashioned and the white areas were yellowed with age. On the back was a short poem and some words that used to make me feel sad. My Mother told me that it was given to her Mother following a mass for Peter Roughley who was married to her Aunt Sally but was killed in World War One. Years went by and these items just became part of my childhood memories but I never forgot the story of Peter and Aunt Sally and often wondered what had happened to him. By the late 1990’s my Mother lived alone for the first time in her life. We would talk for hours about family history. I think it made her feel closer to the people who had gone. She described nights when all their relatives came to stay to get away from the blitz in Liverpool not knowing if they would have a home by the next day. When she died in 2003 we were left to empty a house full of memories while our hearts were heavy with loss. Looking through the boxes brought back all those childhood memories, I could almost smell Mum’s stew cooking! There amongst the memories was the black-edged card that fascinated me so much as a child. “Peter Roughley” the name conjured up memories of my Great Aunt Sally. I had met her only once or twice when taken to her flat in the Scotland Road area of Liverpool, where she lived alone. She was quite elderly by that time. I remember feeling very sorry for her that she didn’t have any children. I was only about six at the time but I couldn’t imagine a person having a life where there weren’t children running around playing. I wondered how different her life may have been if Peter hadn’t been killed. He was so handsome – I had found a couple of faded photographs taken in his Kings regiment uniform. He looked too young to be married, never mind sent off to war. I didn’t have any pictures of Sally but decided that her and my Mother were so alike in their old age that they must have looked similar when young – small, dark hair and blue eyes. I imagined her, beautiful, young and alone waiting for news of her new husband together with thousands of other wives, girlfriends and mothers. One day she would receive the news that he had been killed in action. He wasn’t coming back to her ever again. She would never see that handsome face again, never put her arms around him again nor feel his around her comforting her in difficult times. She would not have lots of babies like her other sisters. She must have felt that her life was over. I wanted to know more about them. Finding out more became an obsession; I just couldn’t let it go. I later wondered if his spirit was restless and would only find peace when his story became known – it would be a tale which would make me realise that these men who died far in a “foreign field” were not just names on war memorials but real men who are connected to us. I had looked Peter’s name up on the Commomwealth war graves website to see if there was any more information about how or where he died. The site referred to him as “Peter Roughley DCM” The Distinguished Conduct Medal– second only to the Victoria Cross was awarded for bravery. It also said that he was buried in Hooge crater cemetery, Leper, West-Vlaanderen, Belgium. I remembered one of my Mother's stories about Peter getting a medal. Aunt Sally was supposed to go to London to pick up a medal but she didn’t know if she actually went, as they were so poor that she doubted that she could have got the train fare together. I looked through the bag of medals she kept in the house – there was quite a few, mostly from the WW2 except for an odd one or two, which turned out to be my Grandfathers WW1 medals, but it wasn’t there. Looking back, it would have been amazing if it had, as these medals are quite rare collectors items. A bit more research turned up the citation in the London Gazette. I felt a lump in my throat as I read the citation, here was this young man who risked his life for his friends, died and our family hardly remembered him. I felt sad that he had been buried in Belgium and it was highly unlikely that anyone from our family had ever laid flowers on his grave. I felt I had to rectify this so on a cold but clear weekend in March we travelled to Ypres and visited the cemetery at Hooge Crater. We found Peter’s grave on Sunday morning. The sky was clear and blue and we could see for miles. A church bell rang appropriately in the distance as we laid flowers on his grave – deep purple coloured tulips. We shivered with sadness not only for him and Sally but for the others who also gave their lives for King and Country – the graves went on forever. As I laid the flowers I thanked him for the freedom we have and we take for granted. I cherished my husband and my life that bit more from that moment. We came back to England and got on with our lives. I no longer felt the same need to keep trying to find out what happened. Maybe his spirit was able to rest now, maybe he did not want his sacrifice to be forgotten. I hoped that there was an afterlife where they were both together. A number of years later I received an email from a collector who had just bought Peter’s medal. He kindly sent photographs of it and agreed that next time he was in the area – he would bring it along for us to see, but the medal itself is no longer important, after all its just a piece of metal. What was important was that Peter’s story not been forgotten. He, together with so many of his generation, had made a lasting impression in time. From the Liverpool Mercury, Deaths and Inquests,18/1/1913 - Concerning Peter's father. "Accidental death is the verdict by the Liverpool coroner on Carter, Peter Roughley of Bond St, which occured on peculiar circumstances on Monday. He was loading his lorry at the Trafalgar Dock and proceeded down Waterloo Rd, while leading his horse he collapsed. 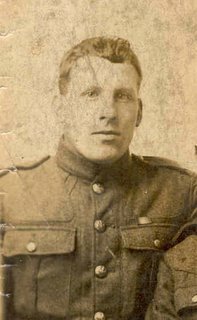 The wheel of the lorry passed over him and he suffered fractured ribs and internal injuries and died shortly afterwards"
By the time war broke out in 1914 my Great Grandfather Charles was aged 33 and supporting a large family. He signed up for the army at Seaforth in north Liverpool in January 1915 and was assigned to the Royal Field Artillery. After training in Newcastle he was posted to France , mainly in defence of the Souchez Valley and Arras , although he did have spells on the Somme and Ypres . Sadly Charles was killed in action on 22nd March 1918 on the night the Germans began their final great assault on the Allies – Operation Michael. On that day the Royal Field Artillery alone had fatal casualties on the Western Front of 113 men from the rank and file and 9 officers. Charles is buried at Bucquoy Road Cemetery in France . William Royden served in the Great War with the Liverpool Scottish, with whom he had already been a territorial since 1910. His story took many turns and was tragic in many respects. His legacy also took a further twist in 2010, when it was discovered that he had descendants alive and well, while his relatives were unaware of their existence. This is now part of a larger work covering his sister and brothers who were also badly affected by the war. Thomas was born October 1897 In Hoylake, to William and Jane Ann (Croft) The 5th of 7 Children, and the youngest of 2 sons. Thomas was our Great grandmothers little brother. Although we never met him, we knew about him, as my Gran who only died in 1982, would tell us about her little brother often, and of how he never came home. She said, he was only a boy, he was a sweet child, not clever, but not a problem to his parents. From a very young age he would be up at the crack of dawn, to deliver milk and eggs for Mr Howard, the local farmer. From about 1912, Thomas went to live and work with Mr Howard at Green Lane, Great Meols. Thomas pictured with a few of his comrades. 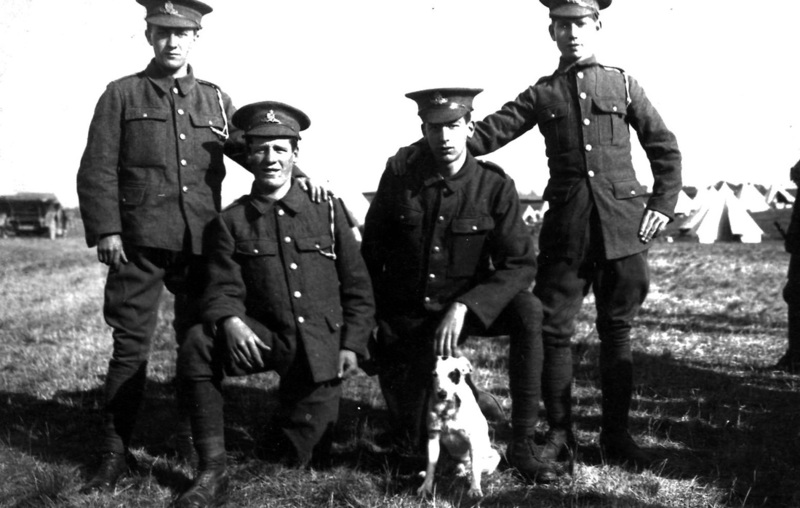 The dog is probably the regiment mascot. As his medal index card has no date listed, and no 1915 Star Medal was awarded to him, it means he enlisted or was conscripted after January 1916. Thomas's service number is in the batch allocated to the Divisional Ammunition Columns of 55th & 57th west Lancs Divisions in the 1917 renumbering. One of those is probably his original unit, and he was transferred to 293rd Brigade early in 1917. 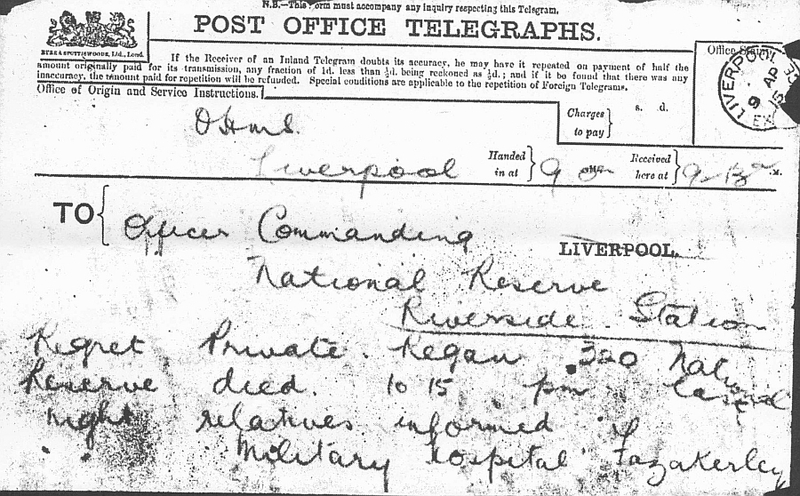 The Soldiers That Died in the Great War database has him listed as signing up in Liverpool. Thomas transfers as a Driver with the Royal Field Artillery, 293rd Brigade. He keeps the same service number 696030. The 1/1st Shropshire and 1/1st Glamorgan Royal Horse Artillery were attached to 293rd Brigade RFA in August 1916. The Shropshires diary notes that they were at Heytesbury, Wiltshire, until going overseas from Southampton on January 21, 1917. Thomas would have been with them when they moved . Once in France they spent the first 6 weeks at Lucheux, 17 miles SW of Arras, before being ordered into the line at Pommier with billets at Warlincourt. When the battle of Arras started they had moved via Wailly and were preparing a position at Beurains, whilst being billeted in barns at Achicourt. On 9 April his Brigade were in position and firing in support of the advancing Infantry. They were soon moving forward again and by the end of 10 April, they were at a sugar refinery at Neuville Vitasse. Another move took them to St. Martin. On 14 April 1917 during the Battle of Arras, Thomas was badly wounded in both legs and was moved to the Casualty Clearing Station on the main road between the villages of Warlincourt and Saulty. His wounds where so serious that he could not be moved onto a hospital elsewhere and he had to be treated at the clearing station. Sadly on 22 April Thomas passed away from his wounds received, and was buried in the cemetery. As kids in the 50's and 60's, November was always a memorial to Tom in the family. My Gran missed him terrible. Of course, its only now that you realise, time does not heel, and memories of someone you loved are never are far away. The grave of Thomas Rutter at Warlincourt Halte British Cemetery, Saulty, France. In 2011 Thomas's Great Great Niece visited his grave and took the photo above. His headstone and army records list him as Thomas J Rutter when in fact his middle name was Stanley. The family have no idea how this happened. Details for Thomas in the cemetery register. His name is on the memorial at Hoylake parish church, and a stone is erected in Hoylake grave yard along with other family members. Submitted by all his family. 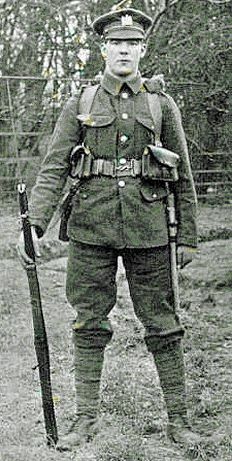 Serjeant Peter Ryan 29014, The King's (Liverpool Regiment) 1st Bn. Killed in action died 01/08/1917, aged 25. Peter lived at 65 Doncaster street with his wife and two children and was employed by " Allan's " before the war broke out. He is buried at at Gorre British And Indian Cemetery, France, and remembered on the war memorial at St Anthony's church, Scotland road, Liverpool.